Global ambassador, all-round genius, Dennis Rodman Photo: Timothy Clark / AFP / Getty Images. “Strangely Irrelevant” began the headline from AOL’s Sporting News last March, informing the world that 51-year-old Dennis Rodman had visited Pyongyang and hung out with ‘Fat Leader’ at an exhibition game between North Koreans and the Harlem Globe Trotters. Rodman was pictured laughing and joking with Kim Jong-Un, and was reported to have stated after the game that the North Korean leader “has a friend for life”. Rodman: Maybe I’ll run into the Gangnam Style dude while I’m here. Photo: Timothy Clark / AFP / Getty Images. UPDATE: Rodman is now again in Pyongyang, apparently to hold an exhibition match between some ex-NBA players and a North Korean team in honour of Fat Leader’s birthday. He’s been making headlines again (along with truckloads of money) after a bizarre nonsensical meltdown during a CNN interview with Chris Cuomo this week. 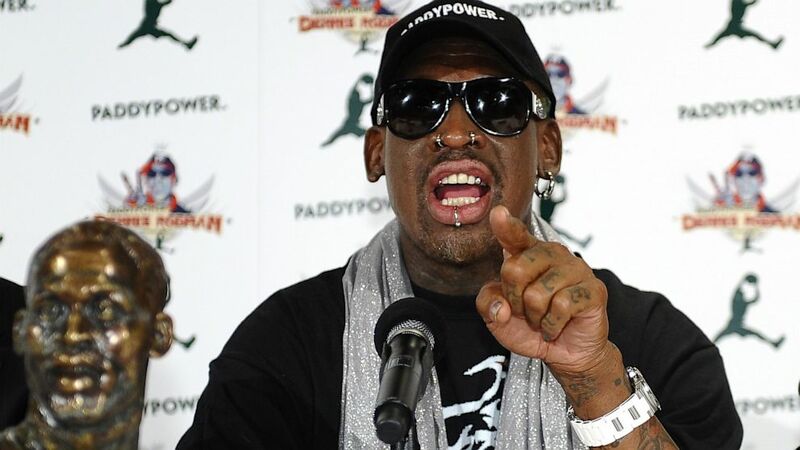 This latest of Rodman’s four trips to North Korea has clearly been carefully timed (you know, with so little going on in the world at the moment) to announce via the global media his new self-appointed role as the unofficial voice of American international diplomacy, and that yes, he’s still an idiot. 5 Comments on "Dennis Rodman visits North Korea again. Update: Still an Idiot"
Rodman is an idiot. Everyone knows that. He is an idiot but his incoherent, drunken ranting in fluent retardese is very entertaining. It is probably also a reflection of his biological brain adapting to its integration into its new North korean robot frame. Still hilarious stuff, as always! LOL irrelevant indeed. Saw on the bbc this morning the point that the rumour first appeared on a paper controlled by the state, inferring that the Chinese government no longer gives a fart about what is said about NK. Probably for the best.